There are a lot of farmers who own the forest in the mountainous district in Japan. There are a lot of chances to cut the tree in the maintenance of the forest. It is possible to cut it a little with a manual saw. However, a lot of trees cannot be cut in human strength. It is very efficient when there is a chainsaw at such time. Because a long blade has been exposed, the chainsaw should take care about handling. There are the one of the engine type and the one of the motor type in the chainsaw. The thing of the engine type is generally a main current though the thing of the motor type seems to be convenient, and the breakdown to be also few in the place with the power supply of 100V. The name of each part of the chainsaw and How to use. This photograph is chainsaw (Kyoritsu GC301) of the gasoline engine type that I am using. The length of the blade is a small short (35cm in the guide bar and 14 inches), model. 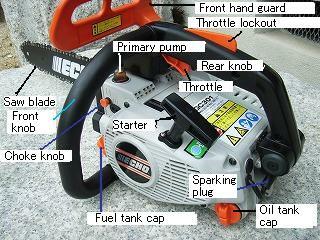 The engine It is chain type blade as for the rotation of (engine displacement about 30cc) is told and the tree is cut. An automatic centrifugal clutch has adhered from the engine between saw, and the rotation of the blade stops automatically when the rotation of the engine is dropped. There is reception desk hand guard between saw blades though the tree is cut with a reception desk steering wheel and a rear steering wheel. When this is knocked down ahead, the brake is applied to the chain blade. When the fuel and the Cheung oil are put in, the engine is started. The reception desk hand guard is pulled forward after the warm-up and Cheung's brake is released. If it firmly supports by the right hand of a rear steering wheel in ..reception desk steering wheel.. left hand, the throttle lockout lever is gripped, and the throttle is pulled little by little, the engine becomes a high rotation. At this time, the centerline of the body is prevented from coming on the extension wire of the blade. The head and eyes are moved from the extension wire of the blade. This is very important because of safety. The foundation of a blade lower of Cheung is applied and cut in wood. The kickback happens when the point of the blade and the Cheung upper part are applied to wood and it is very dangerous. It falls, and the position of wood is the above and moves sideways below in the reactionary though can do by everyone only if wood is cut the movement in the self-respect of wood after wood is cut of wood. It is very dangerous if not working though this is forecast. If this cannot be done, it becomes a serious fatal accident. The reception desk hand cover is knocked down before (To the side of the blade). Gasoline is sent to the vaporizer until the fuel returns from fuel pipe to the fuel tank pushing a primary pump several times. This photograph is a macro photography of the blade of the chainsaw. The tree cuts by the blade in the upper part of the center of this photograph. The difference of height with the right depth gauge (depth) Only the amount cuts. Round file of 4mm in the diameter is applied in this model to become it the traveling direction of the Cheung blade and angling about 60 degrees and the blade is sharpened. The depth gauge is reeded with flat file about 0.6-0.7mm low when the depth is shallow. Whether goodness if it does very if the part of the blade is often observed is understood at once. When it becomes impossible to recover sharpness even if the set is done, it is a Cheung blade is exchanged. A blade without fail specified of the manufacturer It exchanges it for (It is chain type 91VG, pitch 9.35mm, gauge 1.27mm, and numbers 52E of links of Oregon in this model). Putting the Cheung blade is always made to become properly. It influences at the machine's life and is dangerous when becoming putting too much and slack too much. Please check the amount of oil for the Cheung blade. Moreover, the adjustment of the automatic oil pump is adjusted if there is a necessity. Safety glasses are used without fail. The cutting rubbish might fly when the chainsaw is used. Clothes wear long-sleeved shirts and long trousers, and it puts on shoes like the gum boot. The hat and gloves are worn without fail. The purpose of this is to protect the body and it is very important. Oiling or grease is injected into the part where the chainsaw moves mechanically. However, do not put up oil to an automatic centrifugal clutch. The mixed oil is used for two-cycle engine. It makes it to a humidity mixing ratio specified of the manufacturer. Generally, the engine oil and gasoline are mixed with the ratio at 1:20-1:50. When not understanding well, It makes 1:25. It cuts it in the part to which the blade moves forward. Because the kickback is generated in the part where the point and the blade of the blade move to the point, it is dangerous. When storing it without using the chainsaw for a long term, the fuel in the tank and the vaporizer is emptied. Moreover, it drives until stopping after the fuel is pulled out. Otherwise, the jet where the vaporizer of the engine is thin might be blocked.